This research is now complete. It has resulted in three published papers. Following our participation in Dave Cormier’s open online course – Rhizomatic Learning – The Community is the Curriculum, Frances Bell, Mariana Funes and I are keen to research what happened, our shared experiences and what we learned in this course. We invite you to participate in this research by completing our survey which you can access here – http://bit.ly/Rhizo14survey Details of how we are approaching this research are included in the survey site. The following table indicates how we plan to use research data in our study. Please contact us if you have any queries. On the 18th June Frances Bell and I presented a session for the Liverpool John Moores University’s teaching and learning conference. The title of the session was Teaching and Learning in the Rhizome: Challenges and Possibilities. Follow the link for further details. Our first paper has been published by Open Praxis today. We also have a second paper in submission and are working on a third. It has been a long time since we have posted an update, but we have not been idle. In November we submitted our first paper to Open Praxis and heard yesterday that it has been accepted for publication. It was accepted without any requirement for changes, but we are doing some final edits. Hopefully it will be published in the Jan – March issue. Mackness, J. & Bell, F. (2015). Rhizo14: A Rhizomatic Learning cMOOC in Sunlight and in Shade. Open Praxis. (Accepted for publicaton). Many thanks to all those Rhizo14 participants who supported us in this research, by responding to our surveys and questions. But our research is not over. We are currently working on two further papers, which we hope to have submitted before the end of March. We’ll see. We’re not in any rush and are very much enjoying the process. We now have to complete our data analysis. We think we have enough data for at least two, if not more, papers and hope to be ready to submit at least one, if not two, before January 2015. We will also think about alternative ways to share and publish our work. That’s the aim, but we are not in a rush. The more we analyse the data, the more we learn and the more we have to learn. Here is the information about the presentation we gave at the ALTMOOCSIG conference in London in June. 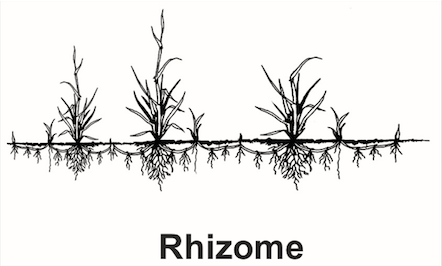 June 27 2014 ALTMOOCSIG Conference The Rhizome as a Metaphor for Learning in a MOOC. See also Emerging ambiguities and concerns for blog posts about this presentation and the related Prezi. The Rhizomatic Learning Survey is now closed. Very many thanks to all those who took the time to think about and respond to our questions. The next step is to code the responses we have received and identify significant themes. Once we have done this we will be contacting respondents who indicated that they would be willing to answer follow up questions in an email interview. I think we will soon be wallowing in data. Maybe we will end up with enough data for more than one paper. I hope so. I always find research more satisfying if it is ongoing, rather than a one-off. We have just sent this email (copied below) out to survey participants who have, to date, participated in our survey. I am posting it here in the hope that those who posted anonymously might see it and also keep up to date with where we are up to. Survey participants can continue to enter the survey and edit as many times as they wish up to the closing date – April 27th. Many thanks to all who have participated so far, including those who have participated anonymously. There is still plenty of time for others to complete the survey. 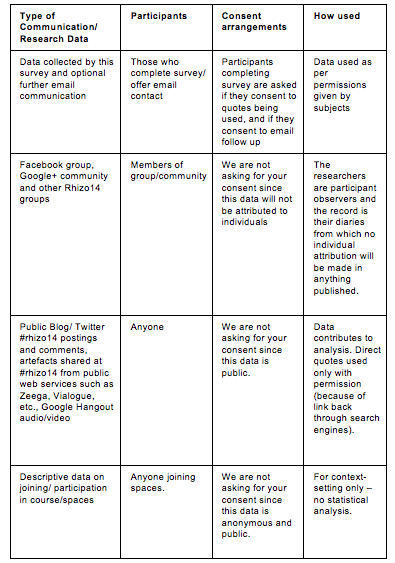 We welcome all responses, acknowledged or anonymous, whatever your level of participation in rhizo14.